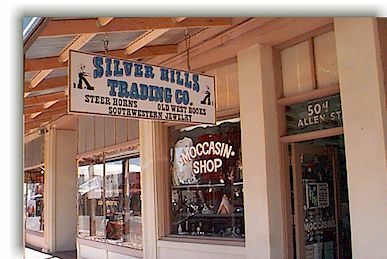 Silver Hills Trading Co. has been in business since 1982 at 504 Allen Street in one of the most unique towns of the old west....Tombstone, Arizona..."The Town Too Tough To Die". The owner's family dates back to 1879 when they homesteaded in the area. As unique as Tombstone is to it's history so is the combination of southwestern jewelry with semi-precious stones set in silver or gold-filled jewelry. We have an outstanding collection of crafted items from throughout the southwest. So, no matter what type of gift you are looking for be sure and browse through our selection of fine jewelry, gift items, t-shirts, hats, Southwestern decorative accessories such as sandstone coasters and tableware, and a variety of books from cooking to Wyatt Earp and Doc Holliday. Please accept our appreciation and sincere thanks for letting us serve you. Sometimes in the rush of business life we fail to say Thanks loud enough. You can be sure your patronage is never taken for granted. Our aim is to please and satisfy you. Let our friendly staff help you with that special gift that will come from the unique southwest. Order with confidence using our secure online site and your items will be shipped within 7 to 14 days. We are currently only shipping to address in the continental United States, if you wish to ship elsewhere please call us during our posted business hours and we will be glad to help you!